From a distance one can see 31 bales of cotton stacked around the Nash & Robertson Cotton Gin and Saw Mill at Clematis in the mid 1890s. The Clematis Post Office was moved from its original site on the Hogan homestead in Section 12-14-5 to the home of Chris Nash two miles south in Section 26-14-5 in 1899. 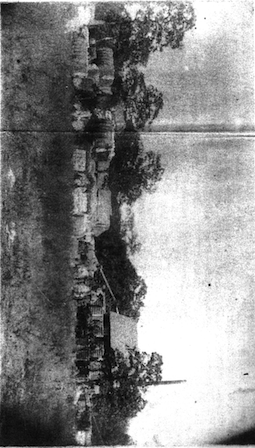 The Nash home and post office was located east of the gin and saw mill shown here. In the photo the three men leaning against the bale are, from left, O. G. Robertson, Christ Nash and Nathan Nash. (Photo Don Sporleder Collection courtesy Mary Nash Stafford). From the files of the Lincoln County Historical Society.